Forest to Farm Biochar – What will it take? Biochar made from woody biomass. Photo: Oregon Department of Forestry under CC BY 2.0. My colleagues kicked off a discussion on biochar with their recent articles. Biochar can potentially be a win for soil health, for carbon sequestration in soils, and for fire risk reduction in forests. Kristin Trippe talked about the benefits of biochar as soil amendments in agricultural soils, and a tool to help producers choose biochar products. Chris Schnepf and Darrell McAvoy discussed the benefits and challenges of using forestry slash to produce biochar, and how mobile kilns can facilitate that. So, if biochar has all these benefits why aren’t all farmers spreading biochar on their fields? And why isn’t all the biomass from thinning being processed into biochar? Well, it is a simple matter of the ratio of benefits to costs. There is no doubt that biochar amendments increase plant productivity, crop yield, and total soil carbon (Biederman and Harpole, 2013). The cost of biochar however, has been just too high to permit breakeven investments in all but the most favorable circumstance (Dickinson et al., 2014). Burning slash pile. 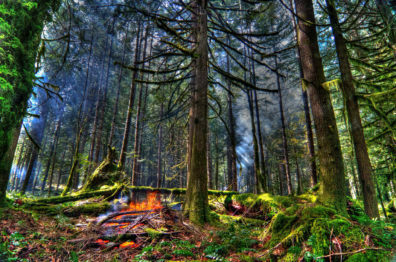 Photo: Oregon Department of Forestry under CC BY 2.0. In order for widespread adoption of biochar in agriculture to occur, many puzzle pieces have to come together just so to make it economically feasible for forest managers, biochar processors, and farmers. For all three of these entities to be profitable, there needs to be large quantities of biomass, close to a processing facility, and close to farm land. With this in mind, several researchers at Oregon State University, US Department of Agriculture and the Oregon Department of Forestry have been working to to identify a scenario that will make economic sense for all parties involved. A market for the biochar: A market analysis needs to be conducted to determine the maximum price farmers could afford for biochar given the expected increase in yield and reduction in the costs of other inputs (such as irrigation) for a variety of crops: potatoes, alfalfa, wheat, barley, oats and hay. This would also include an estimate of the quantity of biochar that would be needed to supply these farms. The volumes of biochar required to alter soil properties are quite high in comparison to other soil amendments (Trippe et al., 2015), thus prices and costs of applications of other sources of soil amendments must also be investigated in order to determine the potential demand for biochar from forests. Determining the price that a farmer could afford to pay for biochar along with the quantity that will be demanded will help determine what type of biochar processing plant will be feasible to build. 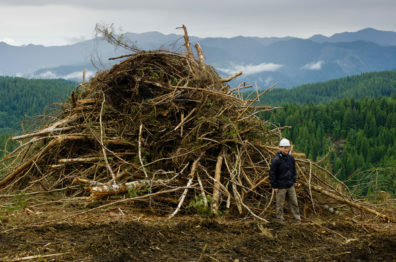 The by-products of forest thinning to reduce fire risk produces large amounts of biomass that can be converted to biochar rather than being burned onsite as waste. Photo: Oregon Department of Forestry under CC BY 2.0. Feedstock Supply: Can the forests in the region produce enough feedstock (recovered biomass) at a reasonable cost to supply the quantity of biomass required to feed a large-scale biochar production plant? Determining this requires estimating the supply chain costs. This includes estimating the quantity of biomass that can be harvested on a yearly basis as well as the transportation costs. In Klamath County, the lack of a pulp market for the small diameter pulpwood sized logs, non-commercial species, and other low-value biomass makes biochar more economically feasible than in other regions. Thus, creating a biochar market for these materials can reduce restoration costs and reduce the release of carbon and other particulates into the atmosphere that result from burning these materials. Design of Biochar Plants: Optimal plant scale depends on feedstock availability and transport costs. For this project the plant construction cost, capitalization, and operation costs are being evaluated for two potential sites. Researchers are also exploring two different biochar conversion technologies along with several different configuration scenarios to determine the best fit considering the feedstock supply and the price point needed for farmers to choose forest biochar over other soil enhancements. Preliminary research on plant designs and placements suggests that we are getting closer to having economically viable biochar operations in the Pacific Northwest, especially as the cost of harvests decline with new harvest technologies. It is expected that forest biochar has the greatest potential when applied to high valued crops such as potatoes, alfalfa, onions, and strawberries, on farms that have limited water supplies. Be on the lookout for publications on this topic from John Sessions, Kristin Trippe, John Campbell John Bailey, David Smith, Daniel Leavell, Stephen Machado, and Marcus Kauffman, who are currently working on the various aspects of this study. Biederman, L.A. and W.S. 2013. Harpole, Biochar and its effects on plant productivity and nutrient cycling: a meta-analysis, GCB Bioenergy, 5:202–214. doi:10.1111/gcbb.12037. Dickinson D, Balduccio L, Buysse J, Ronsse F, van Huylenbroeck G, Prins W. 2014 Cost-beneﬁt analysis of using biochar to improve cereals agriculture. Global Change Biology Bioenergy, 7:850–864. Trippe, K, S.M. Griffith, G.M. Banowetz, G.W. Whittaker. 2015. Changes in soil chemistry following wood and grass biochar amendments to an acidic agricultural production soil., Agron. J. 107:1440–1446. doi:10.2134/agronj14.0593. This entry was posted in Carbon & Soil Organic Matter, Greenhouse Gas Emissions, Sustainable Practices on May 17, 2018 by sonia.hall. 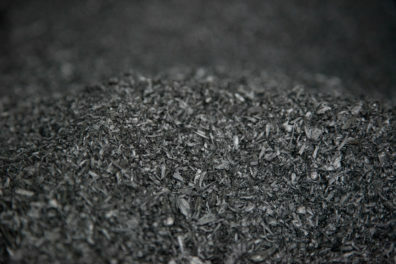 Biochar is an essential soil amendment which removes pollutants and toxic elements from the soil. It prevents fertilizer runoff, soil leeching and protects the crops during floods and draughts. Based on Application, the market is segmented into livestock, farming and others. Agriculture which is the largest application segment, accounts for over 72% of the market share.